A screenshot shows the crowdfunding site. 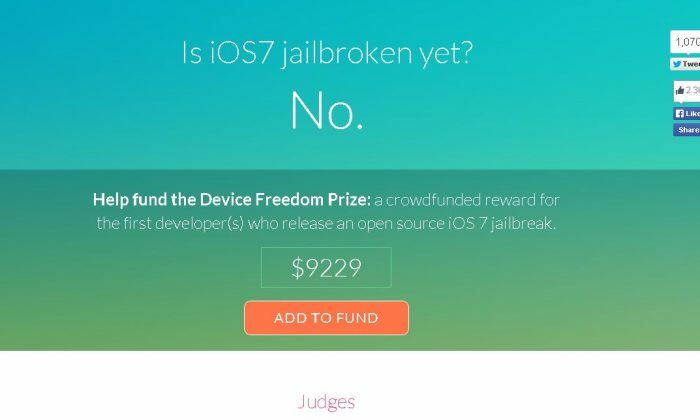 An iOS 7 jailbreak website, isios7jailbrokenyet.com, was set up to solicit donations in an attempt to hasten the process of allowing users to run software that’s not approved by Apple. Users have complained that iPhones, iPads, and iPod Touches are too restrictive in what users can use on their devices. So, with previous iOS versions, there has been an effort to jailbreak them, which removes Apple’s restrictions. The iOS 7 has not been jailbroken jet, but the website–organized by a disabled man–has generated more than $9,000 as of Saturday for anyone who can do it successfully. “We strongly believe that users should have the freedom to control their devices. We wanted an open source jailbreak for iOS 7, giving users the capability to install what they want on their own devices and the ability to audit the code they’re using to do so. Jailbreaking is also critical to ensuring that the disabled are able to use their mobile devices as easily as possible. So we started a prize for the first people who can do it,” it reads. The organizer of the website, Chris Maury, told the Washington Post that he has Stargardt’s Macular Degeneration, which is a genetic disorder that damages his vision. He said that Apple’s standard iPhone features don’t meet his requirements and some third-party apps aren’t available in the Apple Store. The crowdfunding site says that the jailbreak software has to work on iPhone 4S, 5, and 5C running iOS 7. It also has to be untethered, publicly released, free of charge, and released under one of the OSI-approved licenses. According to the IB Times, Cydia creator Jay Freeman, who goes by the handle Saurik on Reddit, wrote that the jailbreak-for-bounty project has shortcomings, and he added that another company is coming out with an iOS 7 jailbreak shortly. “The primary problem I have with this website is that it attempts to change the dynamics from one of ‘people who do things that are fun to make devices more open’ to one of ‘people who do things to win cash prizes,’” he wrote.